It is easy to see why Eddie Giacomin is such a fan favorite when looking at his impressive NHL career. Giacomin is a six time NHL All-Star, 25th in the NHL.s All Time career wins with 289, 19th in career shutouts with 52, and co-winner of the 1971 Vezina trophy recognizing the best goalie in the game for that year. Eddie is known for his acrobatic goaltending style between the pipes and for his aggressive wandering away from the goal to help the defense and sometimes even the offense. Giacomin was inducted into the NHL Hall of Fame in 1987, who would have thought that the kid who was told he wasn.t good enough for junior hockey would one day be in the Hall of Fame. To show their appreciation for Eddie.s time with the New York Rangers, they retired his # 1 in 1989. Giacomin is still till this day considered a legend with hockey fans, especially his beloved New York Ranger fans. 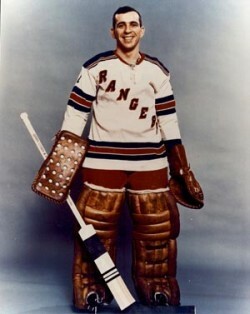 The legacy Eddie left with the New York Rangers has made him a standout in sports history and worthy of recognition. He was elected to the National Italian American Sports Hall of Fame in 2008.